These delicious soups will keep you warm all winter long! With the cold and wet of January settling in, most of us are finding ourselves suffering from colds, cabin fever, and the effects of the chill. When you’re in need of a warm-up, there’s nothing like a steaming hot bowl of homemade soup to make you feel great. Plus, when you make it at home with quality, local ingredients like produce from Baywater Farms, you’ll be getting invaluable nutrients! Here are a few of our favorite soup recipes to get you inspired! Butternut squash, apple cider, and garlic all make up the base of this delicious and hearty soup. We love these three ingredients right now because they are all in the season making them highly nutritious and ensuring that they are of high quality. With a hearty base of sweet potato and winter greens, this unique soup packs a protein punch that can’t be beaten. Winter greens and sweet potatoes are both packed with tons of vitamins, and minerals most don’t get enough of in the winter. With a sweet and spicy flavor perfectly blended with creamy coconut, this soup is sure to warm you up. 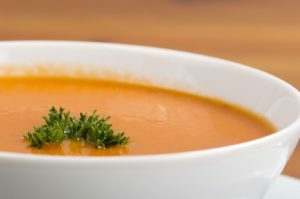 Carrots offer a great source of vitamins B and C in particular, and this soup helps you get in a healthy dosage! You might just fool everyone in your home into thinking this soup is much more decadent than it is. When blended, cauliflower becomes a silky, creamy base perfect for other ingredients. Not only is it a great way to get in your veggies, but because of its light flavor, it lets your other ingredients shine through. Kale is one of our favorite winter greens because it is hearty enough to keep its texture when cooked in soups. This simple sausage soup is the perfect, low maintenance option to throw in a crockpot before you head to work. This entry was posted on Monday, January 28th, 2019 at 1:05 pm. Both comments and pings are currently closed.